Like our name suggests, Holman Plumbing and Water Treatment provides solutions to keep your home or business' water clean. Whether you live in Victoria, Port Hardy, or anywhere in between, we can help you with your water problems. When you're having iron and hydrogen sulfide problems with your water, one option we might recommend is and Aeration system. These systems are designed to treat iron manganese and hydrogen sulfide issues with no chemicals, low maintenance, and a small footprint. Aeration is a natural water treatment method that many water treatment companies nationally and internationally prefer to offer their customers. 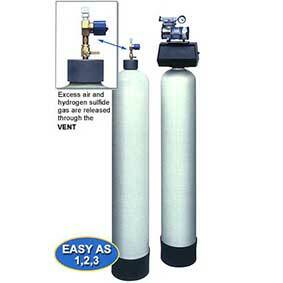 These systems oxidize the water by injecting pressurized air into the water system. During the aeration process, oxygen mixes with iron and hydrogen sulfide, precipitating these undesirable elements. Unwanted air and gases are expelled through the vent allowing maximum air turnover. The final stage of the process is when the water flows through the filtration tanks, producing naturally clean water. Uses natural water treatment methods... No caustic chemicals or salt! Provides a homeowner maintenance free system. Maximizes air injection, increasing levels of oxidation. Systems have a 1" plumbing capacity for greater water flow. Save time and money with aeration. When using chemical treatment methods, homeowners spend precious time monitoring Water quality and end up paying high costs for chemicals. Also, those who use caustic chemicals to solve one Water problem may potentially create other problems. The storage and handling of caustic chemicals can be hazardous and the responsibility of blending the proper ratio of chemicals into the water can be difficult. "Airing out" water problems naturally is favored by homeowners when compared to chemical treatment methods. Using air to treat water has an advantage in that it is not toxic, cannot cause bodily harm, nor poses any storage problems. Our aeration system is successful for many reasons. One key to its high performance is the reliability of the Air Pump. The Air Pump injects air into the vent tank without restricting water flow. Obsolete aeration devices such as venturis or micronizers rely heavily on the Well pump system. These aeration devices restrict the flow of water and are not always reliable in providing positive air introduction. The vent is another key component of the system. The vent is an electronic device, Which is capable of expelling air and unwanted gases as fast as the Air Pump injects air (faster if necessary). This high rate of air turnover allows better oxidation of contaminants in the water. Mechanical type air vents on the market may release air too slowly, thus providing an unacceptable air turnover rate. For more information contact us at Holman Plumbing & Water Treatment!